New research from Network Rail reveals an alarming one in seven drivers report they wouldn’t wait for the barrier or gate to open at a level crossing before driving their vehicle across. In the last five years, six people have lost their lives in vehicles at level crossings, with many more being hurt and injured. Every week around 46 incidents involving vehicles take place at level crossings across the country, with HGVs the most common specific vehicle type involved (32 per cent), and cars the second most common (28 per cent). 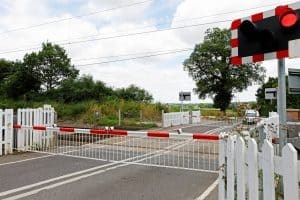 The study reveals a lack of knowledge may be to blame, with almost a third of UK drivers reporting they have never been taught how to use a level crossing (31 per cent), leaving them more likely to be unaware of the dangers and more likely to take risks. It also revealed that nearly half of the drivers surveyed (45 per cent) felt their passengers were their biggest distraction while driving. The thought of arriving late also distracted nearly a third (30 per cent) of drivers, with exams or a hospital appointment being the top reasons for not waiting at the level crossing. Alarmingly, the findings showed one in nine drivers (11 per cent) would go straight over a level crossing if they had checked the train timetable and believed no train was coming. This is particularly dangerous as freight trains or other trains not listed on the public timetable often pass through level crossings at speeds of up to 100mph. To help increase awareness of the dangers at level crossings, Network Rail is partnering with British Transport Police on a national safety campaign targeted at drivers to remind them of the dangers of not following the safety instructions at a level crossing.